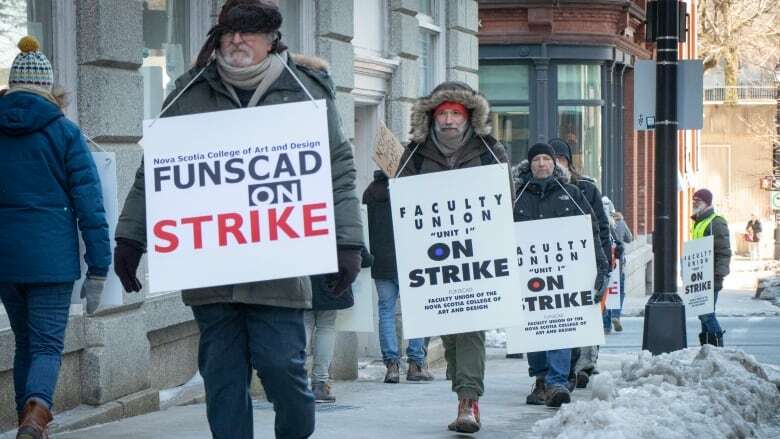 Faculty and librarians at NSCAD are on strike. The 95 union members took to the picket line following the inability to reach a contract agreement. Key issues include a call for a wage increase, a reduction in workload and more job security for part-time faculty. Faculty and librarians at NSCAD are on strike. The 95 union members took to the picket line following the inability to reach a contract agreement. Key issues include a call for a wage increase, a reduction in workload and more job security for part-time faculty. In a news release, union president Mathew Reichertz notes "extraordinary sacrifices by faculty and students over the last seven years" helped the university return to solid financial footing. Those efforts include giving up administrative assistants, a dean and most international visiting scholars. "The real issue is that the administration needs to get busy and do its own job, rather than blaming and shortchanging faculty and students for administrative shortcomings in recruiting, fundraising and institutional renewal." In the release, faculty member Gary Markle said they're experiencing "starvation of the core mission of the university." "The faculty is at its limit; there aren't enough hours in the day to do our jobs and the jobs our assistants used to do. We just can't give any more." But university president Dianne Taylor-Gearing said the school cannot agree to a contract that might jeopardize the recently improved financial condition of the institution. She said the issue of workload, in particular, which would see staff teach fewer than six courses a year "is not affordable." Having full-time faculty teach fewer courses means less access for students, she said, and that's problematic. "They're the ones that students want to spend most time with at NSCAD." The union has been without a contract since last June. The two sides have met 18 times in an attempt to get a deal, and five more with the help of a provincial conciliator. While the school will remain open, and a small percentage of classes taught by non-union instructors will continue, the student union is encouraging students not to cross the picket line. All parties have expressed concern that the dispute could delay the scheduled end of the school year and graduation in April.